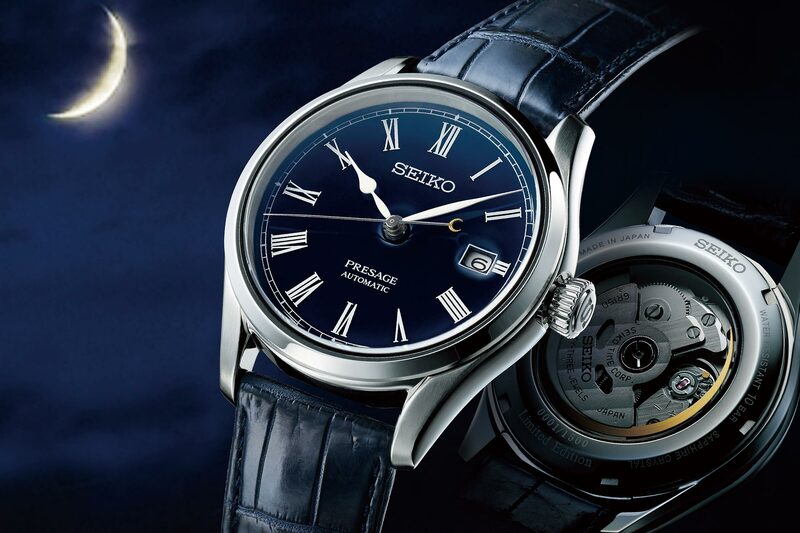 Since its worldwide introduction in 2016, the Seiko Presage collection has never ceased to impress. It all started with superb limited edition chronographs with enamel or hand-lacquered Urushi dials (just that…), watches that were followed by regular production models with enamel dials or funky “cocktail” inspiration, as well as impressive limited editions such as the Shippo. 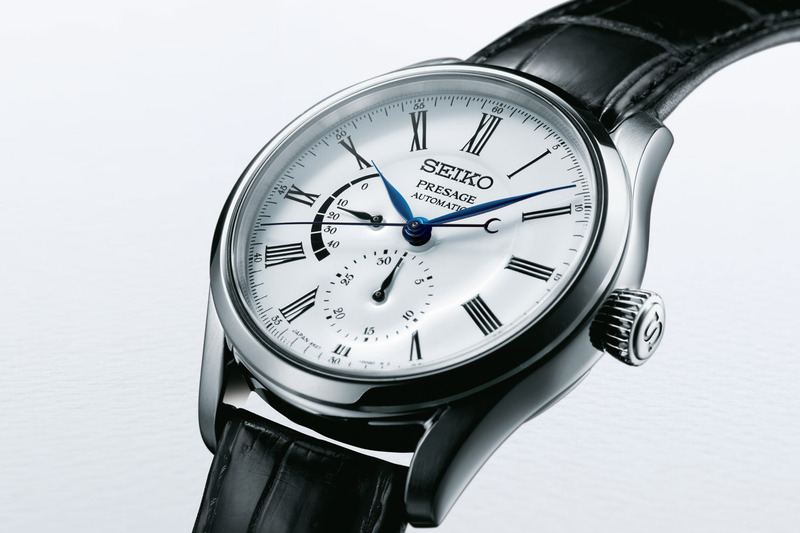 In two years, Seiko has made Presage a collection as interesting as Prospex. 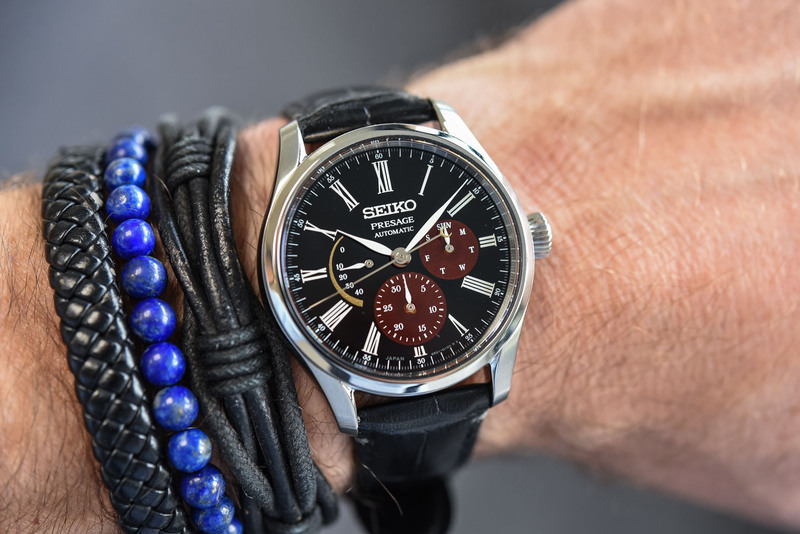 Following this trend, today the brand unveils a new limited edition, the Seiko Presage Urushi Byakudan-nuri SPB085 – and once again, it offers traditional, hand-made Urushi at a stunning price level. 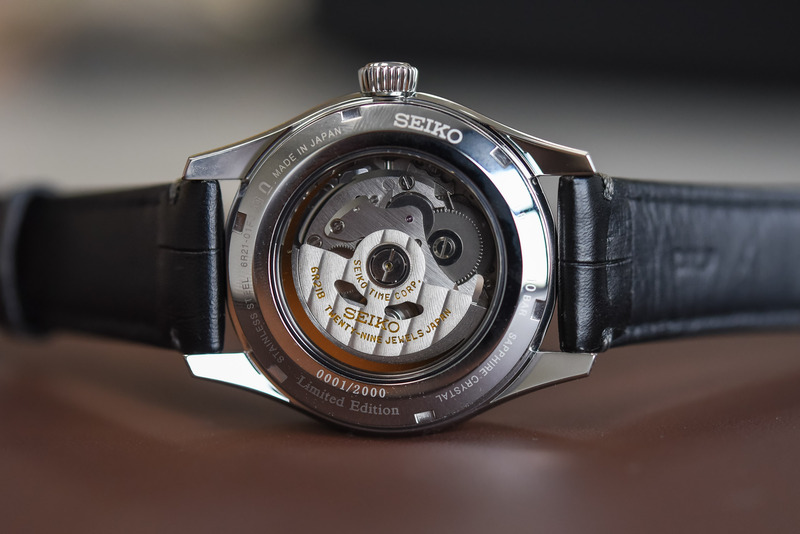 The concept of the Seiko Presage collection was clearly defined in 2016 when Seiko decided to launch this collection worldwide – it was previously a Japan-only collection. 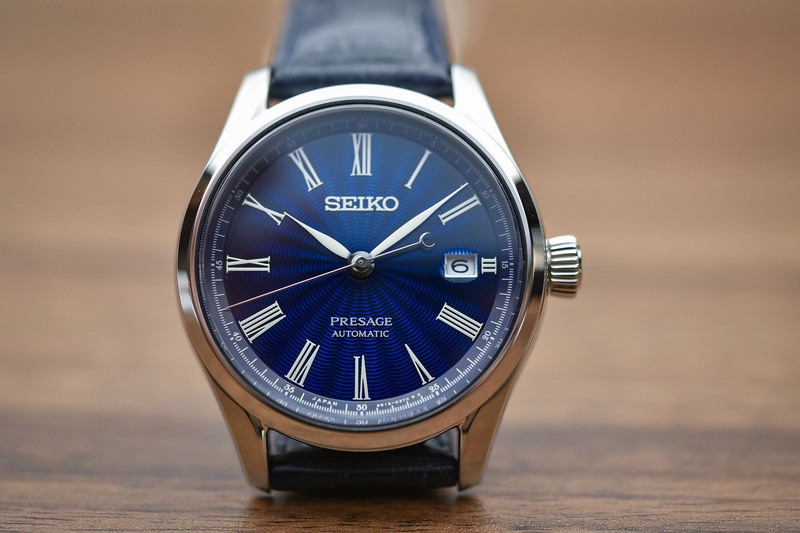 However, since the launch of Presage, the intentions are clear: compete with Swiss watchmaking, not only in terms of style – with classic, elegant watches – but also in terms of craftsmanship… And that’s where Seiko knows how to make the difference! We knew that the Japanese brand was capable of producing beautiful mechanical movements at accessible prices. 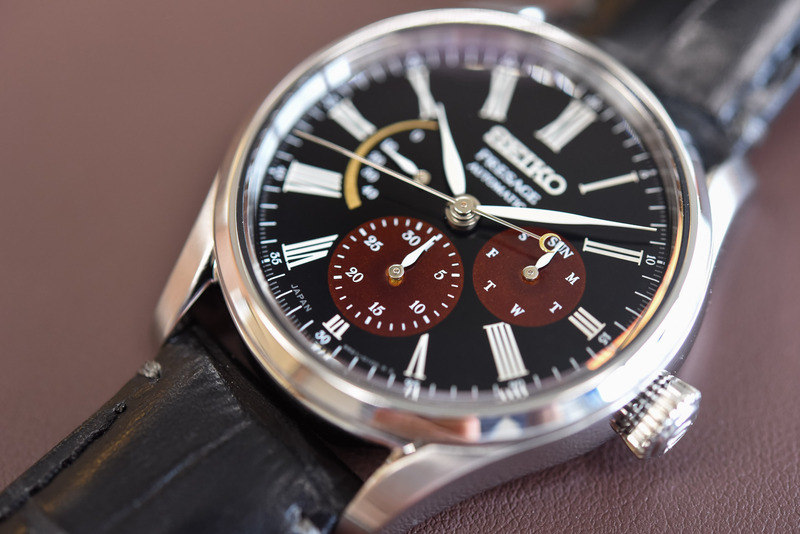 With Presage, it applies the same concept to the dials, with traditional techniques: enamel, Urushi lacquer or guilloché with translucent enamel are available for a fraction of the price asked by Swiss brands. 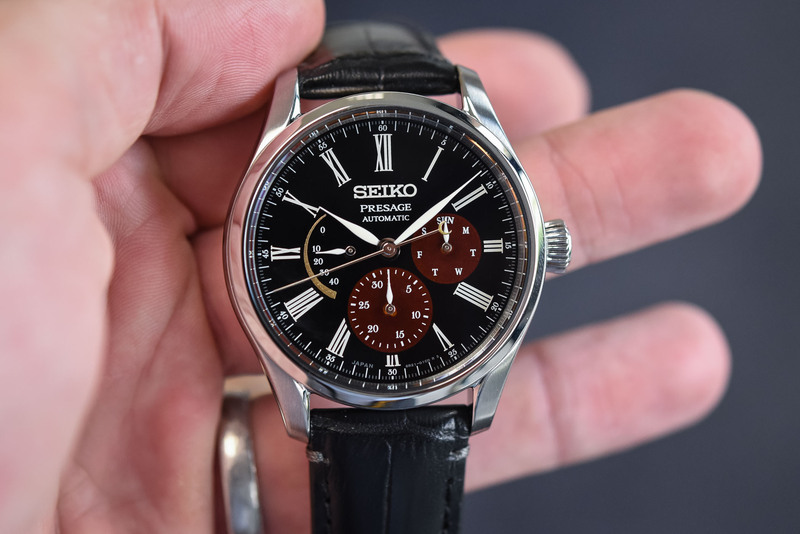 The new Seiko Presage Urushi Byakudan-nuri SPB085 we’re presenting today is another demonstration of savoir-faire, again at a great price (but in a limited run). The main point of interest with the new ref. SPB085 is its dial. For the rest, this watch will be familiar to you as it was already available (with a similar display) with a white enamel dial and a blue Shippo enamel dial. No surprises in terms of mechanics or case either, all of that will be familiar to most watch enthusiasts. 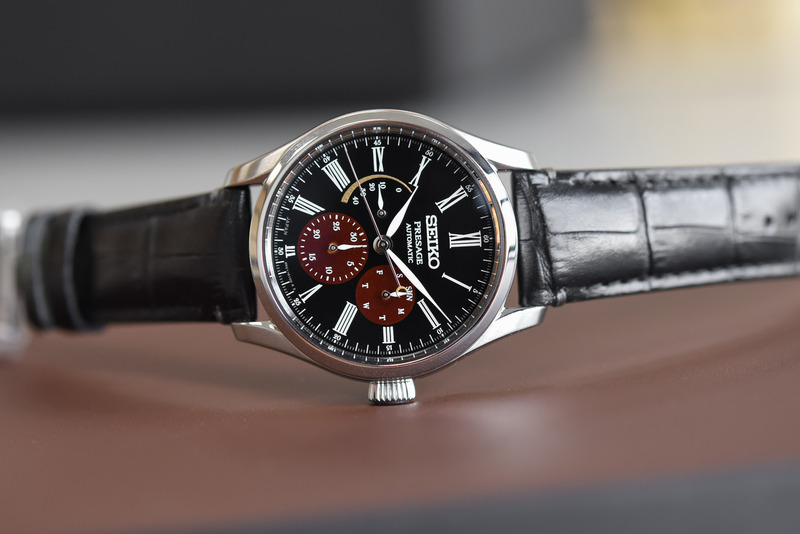 What is new, however, is the addition of an Urushi dial – and not just a single-tone Urushi lacquered one, but a new three-tone version, created with three different techniques named Urushi, Byakudan-nuri, and Maki-e. The dial of the Seiko Presage Urushi Byakudan-nuri depicts the rich tones of the sky and moon just before dawn: a pitch-black sky, red accents where the sun touches and golden hues for the Moon. Achieving these three colours requires three different methods, done in the studio of Urushi master Isshu Tamura. 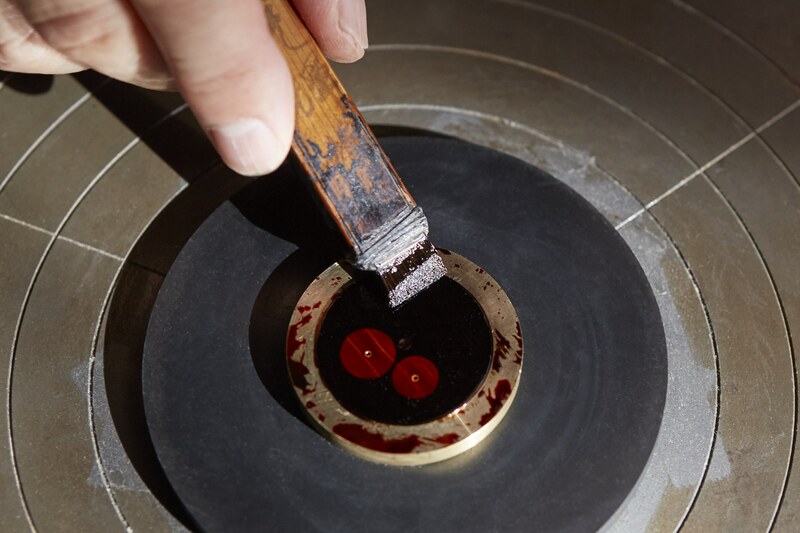 The dial of the Seiko Presage Urushi Byakudan-nuri SPB085 is lacquered by hand, in the studio of Urushi master Isshu Tamura in the Hokuriku region of Honshu. While a normal Urushi dial already made it to the Presage collection with the reference SRQ021 (the 60th-anniversary Chronograph launched in 2016), the new SPB085 is pushing the concept much further with not one but three different techniques. 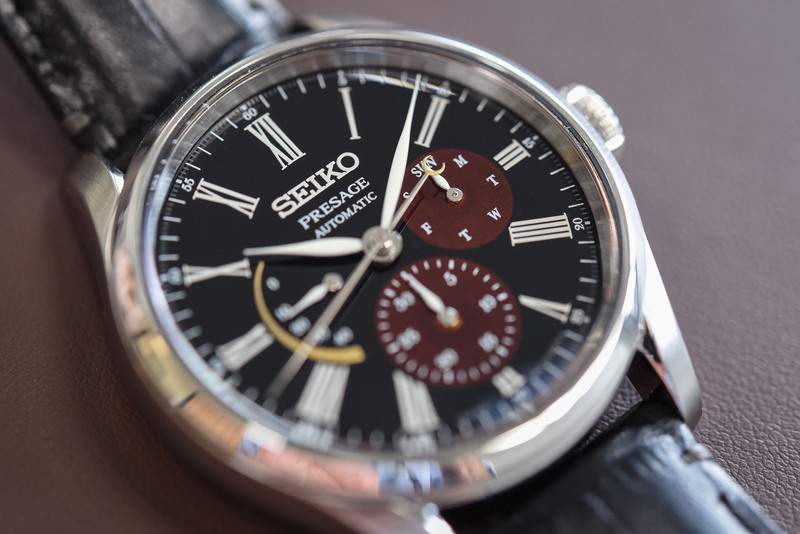 First, the base of the dial is created with a traditional Urushi technique, in which jet-black lacquer is painted by hand onto the metal base of the dial, dried and then polished. The process is repeated several times until reaching a pitch-black colour and a smooth, flawless finish. The result is a deep (really deep) black dial with almost no reflections and a rich colour. Step 2 is the newly used Byakudan-nuri lacquer. Using a new layer of Urushi as the binding agent, the sub-dials are then sprinkled with a layer of very fine metallic powder. The whole dial is then repeatedly painted with a red-tinged semi-transparent Urushi lacquer and then each new layer is dried and polished for as many times as the craftsman deems necessary. The result is a deep, red colour which varies in tone depending on the ambient light – from dark burgundy to blood-like red with orange reflections. The final step is the creation of the power reserve gauge, portraying the Moon, using Maki-e technique. The crescent is first coated with a layer of Urushi lacquer that acts as the adhesive to the fine, gilt-coloured powder that is then applied to it. Once the powder is on the dial, the craftsman gently taps it to disperse the powder evenly across the surface and then uses his own specially chosen material to perfect the surface. The result is an indicator that not only reflects the shape of the crescent Moon but has the Moon’s shimmering, granular texture and contrasts with the smoothness of the sky. This complex process, which requires several weeks of handiwork, results in a rich, luxurious and unique dial – it feels truly unique and like nothing else found on the market. The attention to detail is impressive, especially when considering the price of the SPB085. Regarding the rest of the watch, as mentioned, there are no major surprises. The case and movements are familiar and reviewed several times on MONOCHROME. What we have is a nicely shaped and elegant 40.5mm case in stainless steel with polished and satin-finished surfaces (on top of the twisted lugs) and a thin bezel to have the focus on the dial. The case, as with other Presage editions, is nicely crafted but could be slightly thinner – it is 12.8mm in height and we could live with one or two millimetres less. The watch will then gain in elegance. But that’s a minor flaw. Completing the hand-lacquered dial are white printed Roman numerals and inscriptions – identical to most of the Presage watches – and hand-coloured leaf hands for the hours and minutes. A nice detail is the golden Moon on the counterweight of the second hand – something already seen in the past, on the Blue Enamel SPB069. The display of the Presage Urushi Byakudan-nuri SPB085 is slightly more complex than what we’ve seen in the past. 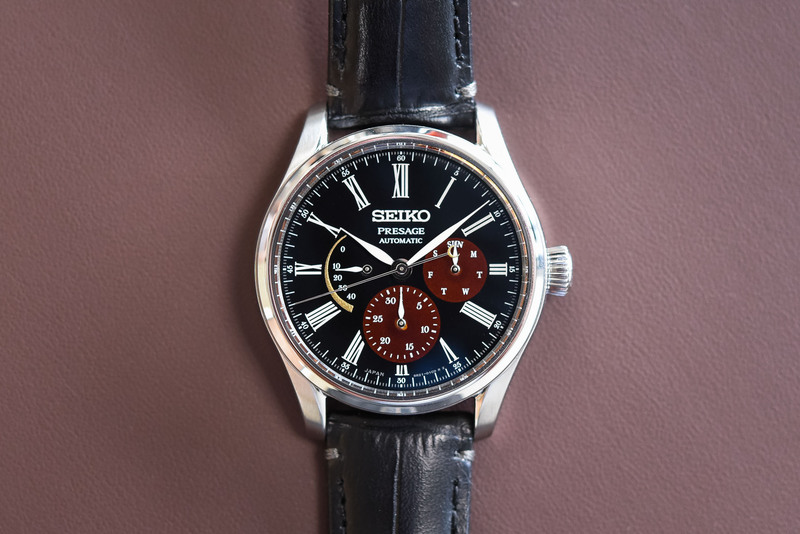 Usually featuring central H-M-S, a power reserve, and a date-by-hand, Seiko adds a day-of-the-week indication at 3 o’clock. Powering the SPB085 is the same base movement as all other Presage watches, meaning the self-winding calibre 6R21. Sharing its specifications with the rest of the 6Rxx family – 4Hz frequency, 45-hour power reserve – it is a very decent automatic movement with a reliable construction. It is partially decorated, with Geneva stripes on the rotor and straight brushed bridges. 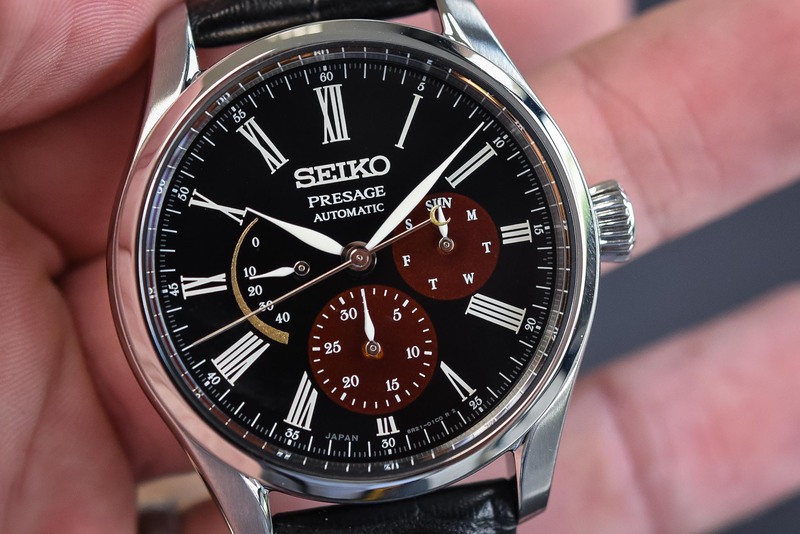 Knowing the complex manufacturing process for the dial, the Seiko Presage Urushi Byakudan-nuri SPB085 will be produced in a limited run of 2,000 watches. It will be available as of early December 2018 in selected Seiko outlets worldwide (we even encourage you to go now to a retailer and pre-order it if possible…). 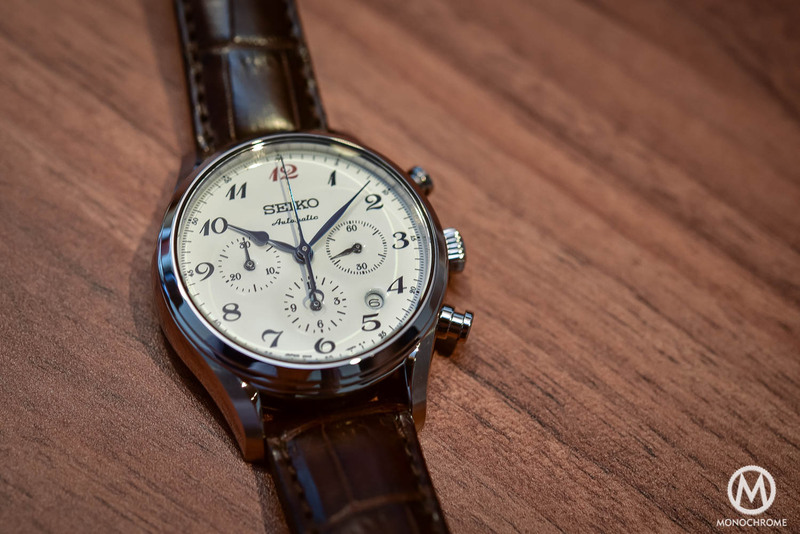 It will be priced at EUR 2,500, which isn’t per se an accessible price but considering the craftsmanship used for the dials, it is again incredible value for the money. More details on www.seikowatches.com. It’s a shame the dial is ruined by red and yellow and it is a mess. The colors don’t go together but the case is brilliant. In total a deep drop relative to the 2 previous limited editions with the blue enamel dial. Would not consider it. JD’s comments above echo my thoughts precisely. Possibly the colour scheme suits Japanese eyes, but I hate it. This color scheme isn’t strange at all in urushi/maki-e art. What are you talking about ? Since when dark red, black and gold don’t go together ? I have enormous respect for Seiko and do own one. I have planned to buy a GS or Urushi Presage for a very long time and have tried both on my wrist. But almost despite myself, I always seem to end up with something else. I once set-out to buy a GS and found myself in a Rolex dealership! But to my eyes, this dial looks weird. Black & azure blue or black & yellow even. Black and burgundy with some strange yellow-brown just doesn’t work. I’d rather almost any other colour combination. My most recent acquisition was a Captain Cook. Why? It has charm. I have never seen a “charming” Seiko. I own several straight razors. Most of them are impressive German-made pieces. Clinical, sharp, exact. My favourite is a French-made razor from the ’40s. It has an organic fluidity which is very appealing. Despite admirable attempts to recreate certain natural/organic textures and colours, Seiko’s very precision detracts from its appeal. I am surprised black Urushi with byakudan nori is not so attracting to many people here. If the black/red/yellow colour scheme is unintuitive, i’d hope to see real Urushi japan product there first. Byakudan nuri is adapted old technique against wood/metal. First, put tiny piece of gold/silver on the surface of material, then paint many layer of transparent Urushi to make it shine. With natural effect of sun light and natural urushi ingredient , layer of urushi start shining like amber with red sparking of gold/silver through the urushi layer. 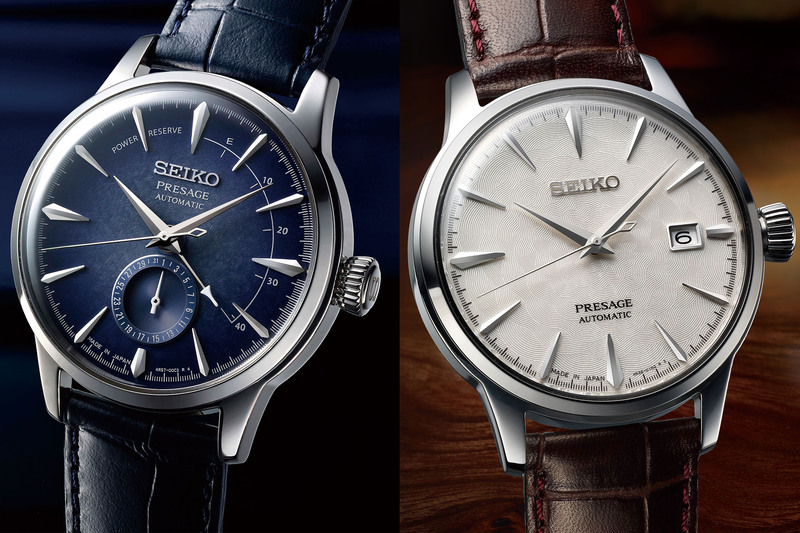 if Seiko tries to re-produce that beauty on their watch, it should be attractive to everyone. Digital photo never tells that we know.